A common refrain lately is that everyone should learn how to code. Computer science should be a core part of middle and high school curriculums, recent college grads who made the mistake of studying liberal arts should immediately enroll in developer bootcamps, and the only reason jobs feel scarce among the working class is that they haven't morphed themselves into software engineers. We disagree. Coding as it’s defined today is difficult to learn and even harder to do well. Not only that, but specialization in other roles is more important than ever. Nonetheless, the ability to code does confer some incredible benefits in terms of productivity and output. This is exactly why we're building Parabola. Think of it as a way to apply the benefits of coding without having to learn how to “code” as it’s defined today. But before we dive into exactly what Parabola is, let’s take a step back and look at the current state of the world. Now certainly, learning how to code could be a fantastic opportunity. But getting to the point where you're familiar with and can use modern programming languages/frameworks for something real is hard. It requires more time and commitment than acknowledged by those recommending learning to code. There's a steep learning curve, entirely new mindsets to adopt, and a large amount of overhead to stay up-to-date. If you want to be a professional software engineer, the investment is sensible. For the rest of us, though, the effort isn't worth it just to be able to use computers more efficiently. Taking a step back, specialization of jobs has been a key factor in the increasing prosperity of the world. Most people don't grow their own food, make their own clothes, build their own furniture, or record their own music (although if you do all of those things, we should hang out!). Instead, a few people specialize in each of those tasks and then sell their work to the rest of us, who specialize in other tasks. The result is work gets done by people who are actually experts in their field. Both quality and output quantity increase. In the business world, we do the same thing. We split our companies into marketing, sales, product, operations, and more. Further still, we have specialties and sub-specialties within each of those departments. In marketing, for example, some people specialize in outbound email campaigns, while others optimize search engine marketing, and still others manage social media. This specialization makes sense. Most companies probably don't want their finance team running their Twitter account, or the marketing team ensuring GAAP-compliant accounting. Why then should people in any of those departments be expected to spend their time learning to code? On the other hand, coding does have a lot of benefits. One definition of the word "leverage" is the amount of output you can get from a given period of time. People who know how to code have a huge amount of this kind of leverage, and can get a lot of output from each unit of time they put in. This is why software engineers get paid so much. These three factors are surprisingly powerful, and are why the most valuable companies in the world are now tech companies. Shouldn't you be able to do these things without learning to code? Now let's be clear. Parabola doesn't do everything that a software engineer can. We've designed Parabola with a set of trade-offs, but they're trade-offs we think you'll really like and appreciate. 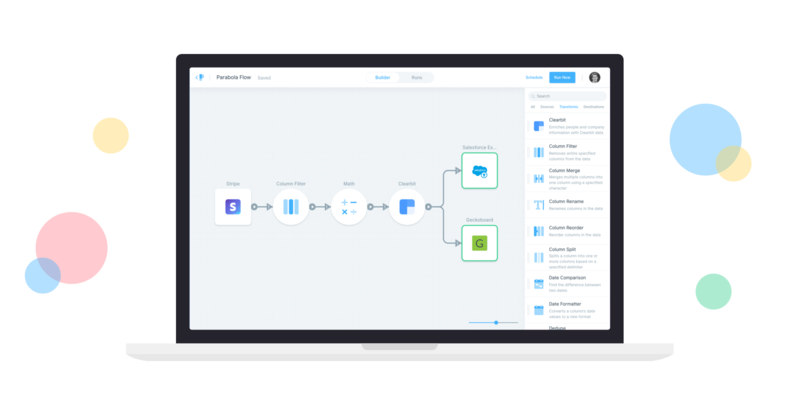 Using an entirely drag-and-drop interface, Parabola enables everyone to create repeatable flows that interact with a variety of other tools. That process where you export 5 different CSV files, run a SQL script someone made you once but you don't know how it works, copy and paste it all into Excel, write a bunch of VLOOKUPS (or INDEX/MATCH if you're an excel ninja) to merge it all together, stare at it to make sure you pasted correctly, delete columns, find/replace a bunch of things, and then 10 other manual steps before you send the results to 5 different people by email? You can build that all into Parabola once, and then it can be scheduled to run whenever you want without any more manual work from you. That's just scratching the surface of what Parabola can do. Parabola can also work with large data sets that would crash a spreadsheet tool, and your flows can even be packaged up and shared with other people. The best part? There's no infrastructure to maintain, no code to write, and no waiting on engineers or IT to help you. You can sign up for free right now and immediately start reducing busywork and increasing your leverage. If you'd like to learn more, you can visit our website at parabola.io or reach out to us at hi@parabola.io.